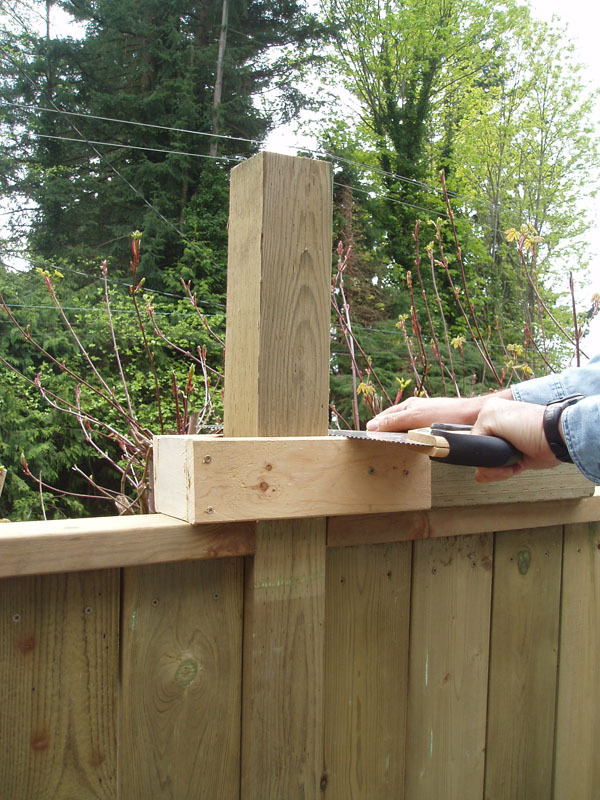 The need to replace our front fence loomed over us throughout the winter, and we briefly considered having someone do it for us. 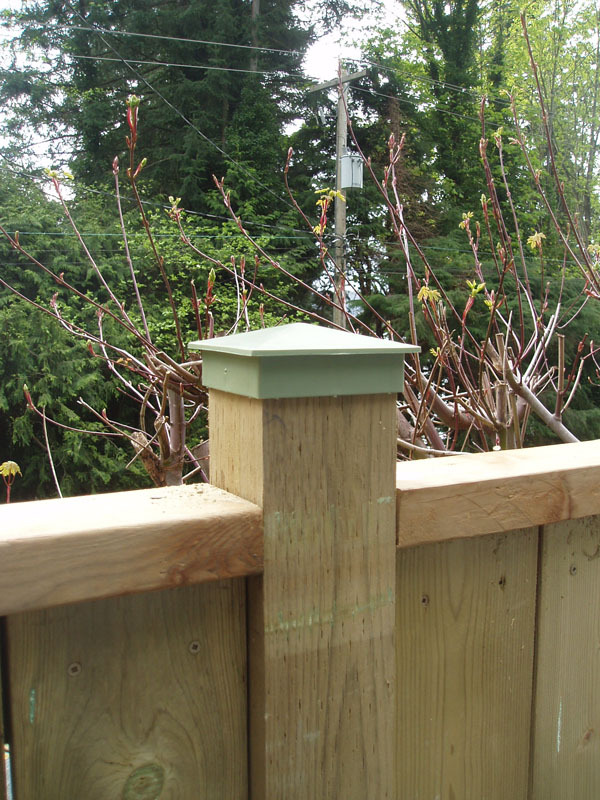 A very nice local handyman gave us a quote of $2800, which succeeded in inspiring us to get on with it ourselves. 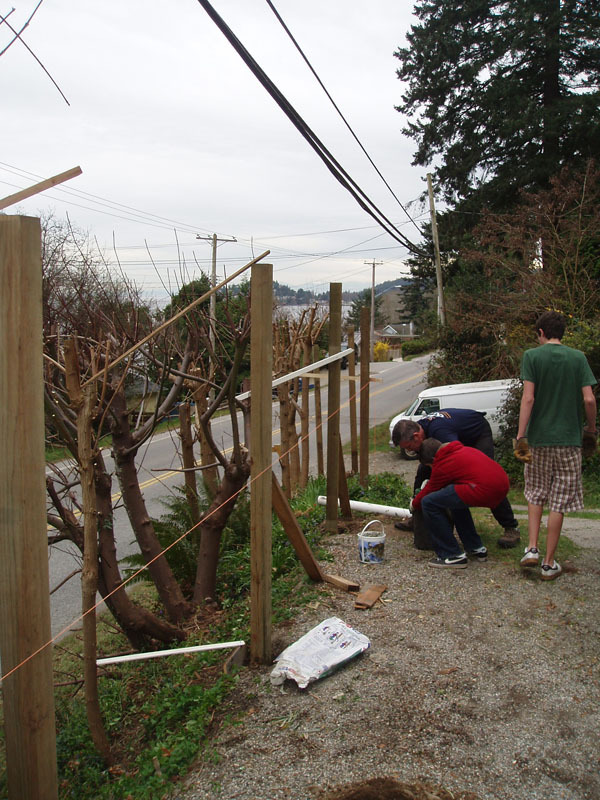 Our good buddies Doug and Jack volunteered to demolish the derelict fence. Thanks, guys. You did an awesome job! 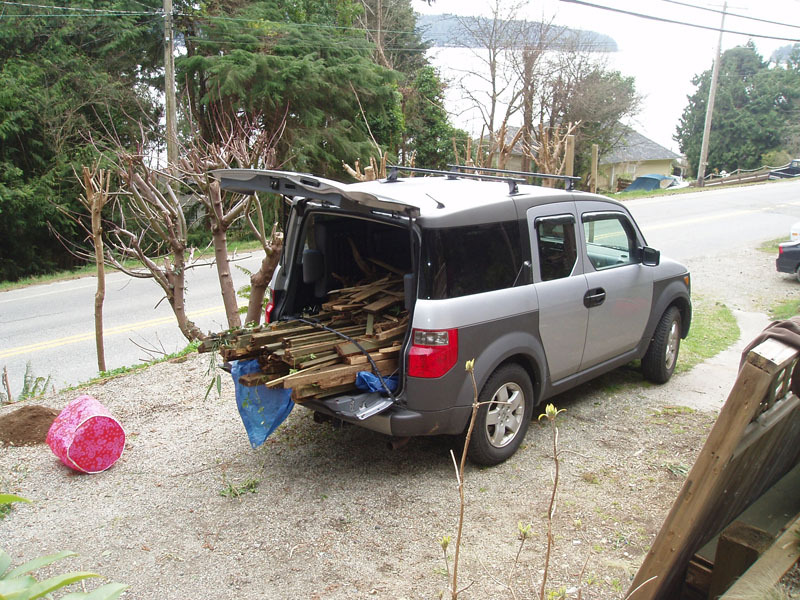 Here is some of it, crammed into the car for disposal. Our urchins helped to set the posts in concrete. And then we malleted on some pre-made caps. 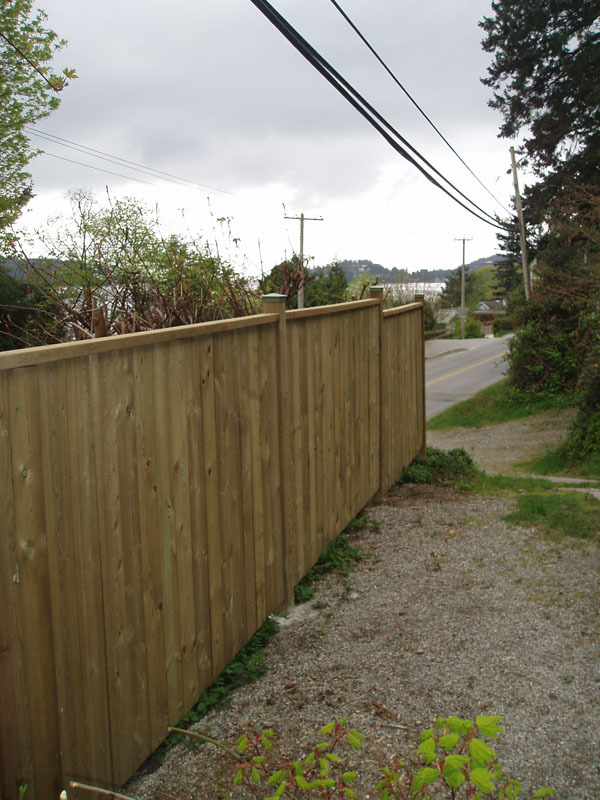 And here is a partial view of the finished fence, which cost a bit less than $600. Until now, we’ve walked about 60 m. east to Soames Rd when in the mood for a pleasant amble on the beach. That route is stroller friendly- and even car friendly for someone with mobility challenges. And it is a pretty walk. Just recently, the regional district built a great set of “Public Access” steps to the beach, just about 40 m west of our cottage, now offering us the choice of a shortcut on our beach treks into the village. 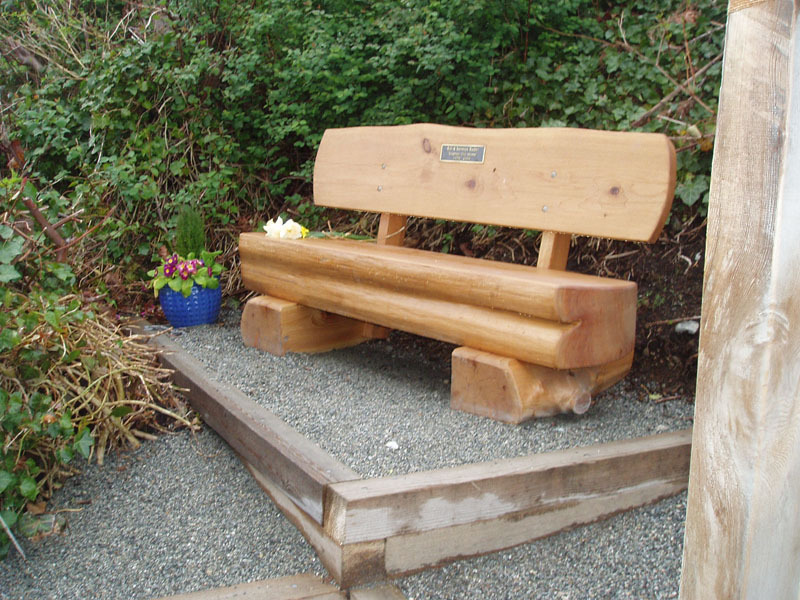 A lovely bench has been established near the bottom, celebrating two individuals who were very fond of Soames beach. There is a good view of Gabriola Island and the Coast mountains from this spot. Altogether, the thing is done very well. 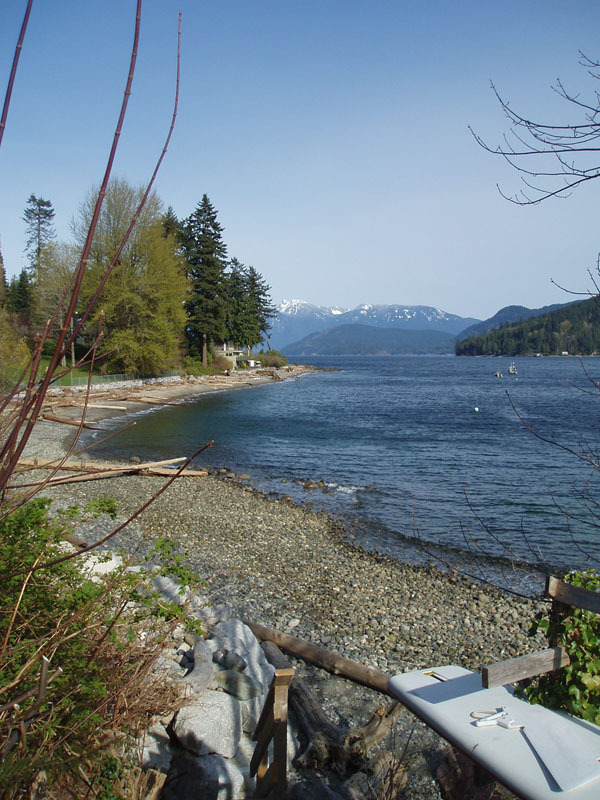 It’s pleasant to know that while we are working to improve our property, the regional district is also implementing local improvements, including replacing gravel on Soames road, maintaining the Soames Hill Trails and providing this great new beach access for our neighbourhood. Thanks to all who had a hand in this! 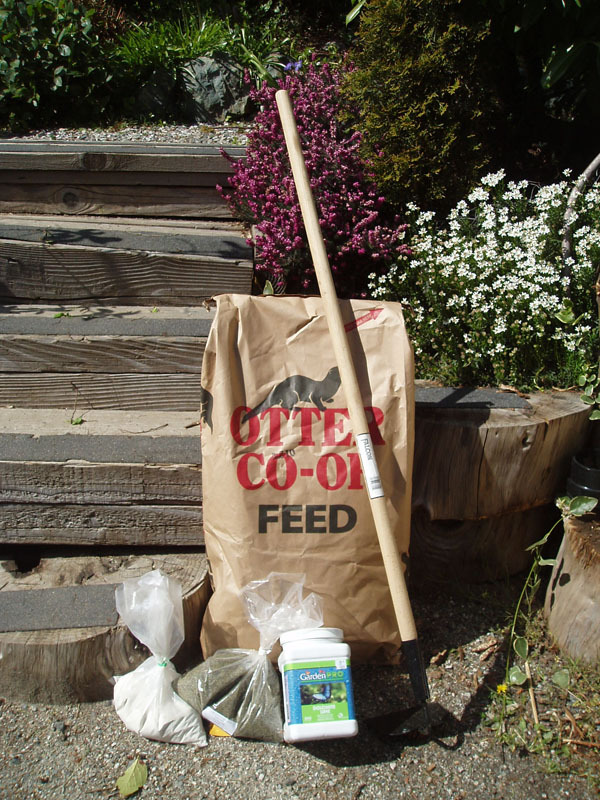 Canola seed meal, kelp and bone meals and lime. 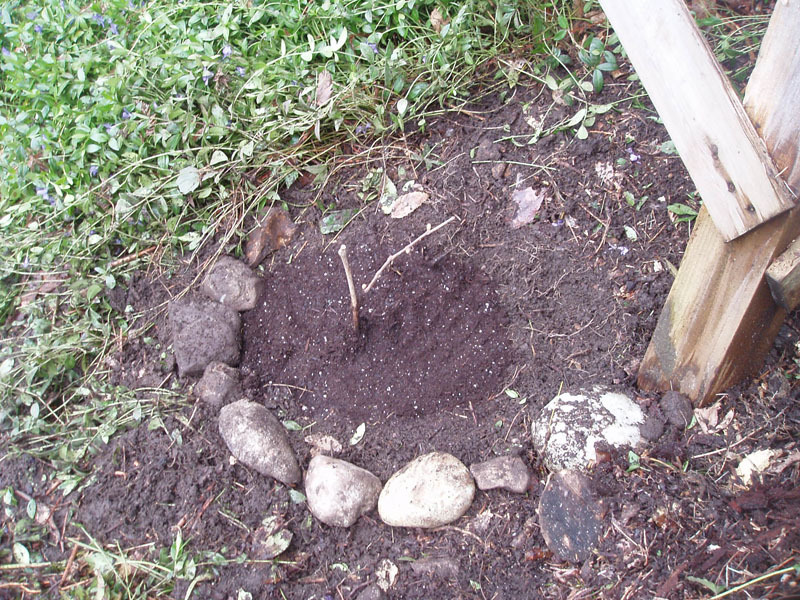 I was inspired by the clarity and good sense of Randy Shore’s recent article about how to feed your garden. Since canola meal comes in a 20 kg sack, you may wish to team up with a friend and split a double batch. 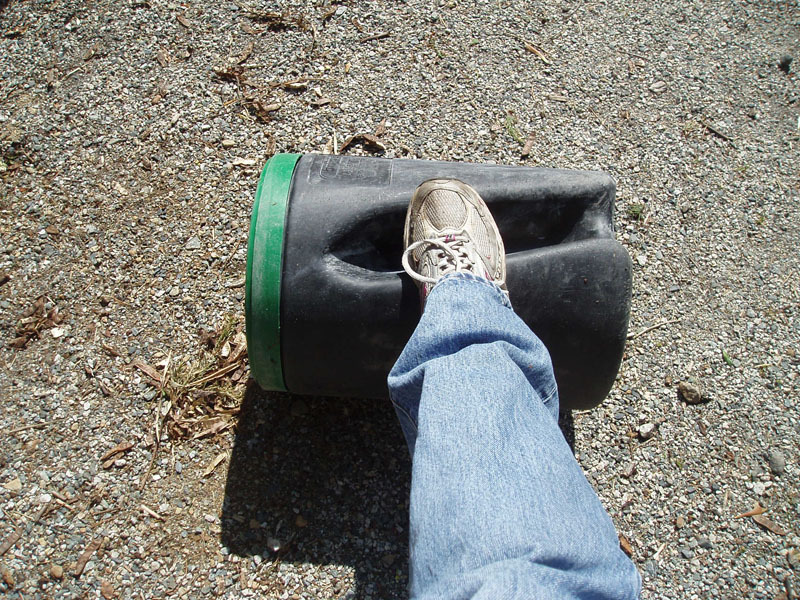 I mixed all of the ingredients in our handy-dandy Lee Valley Od-Job roller mixer – (I’m still hoping they will send me a gift card for my frequent plugs)- the very one recently pressed into service to make concrete for our on-going fence project. 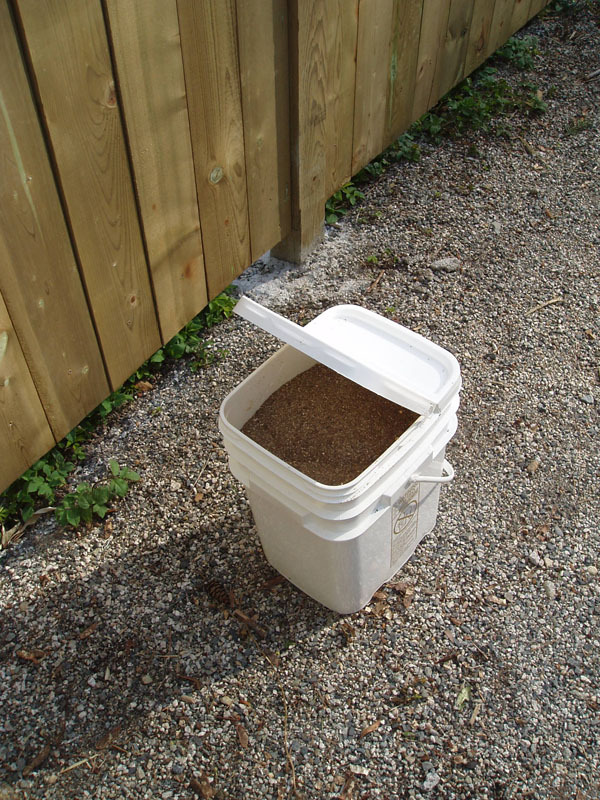 The ingredients for a double batch of this fertilizer came in under $30 and it took just minutes to make. I’m keeping half at the cottage and bringing the other half back to use in my city garden. Thanks for the recipe, Randy. Here are the Coronation vines (table grapes) my sister gifted me. Once you’ve got ’em, you have to plant them. We had a howling sort of rainy night, power out, and not too much sleep; a late start to our morning despite our best intentions. 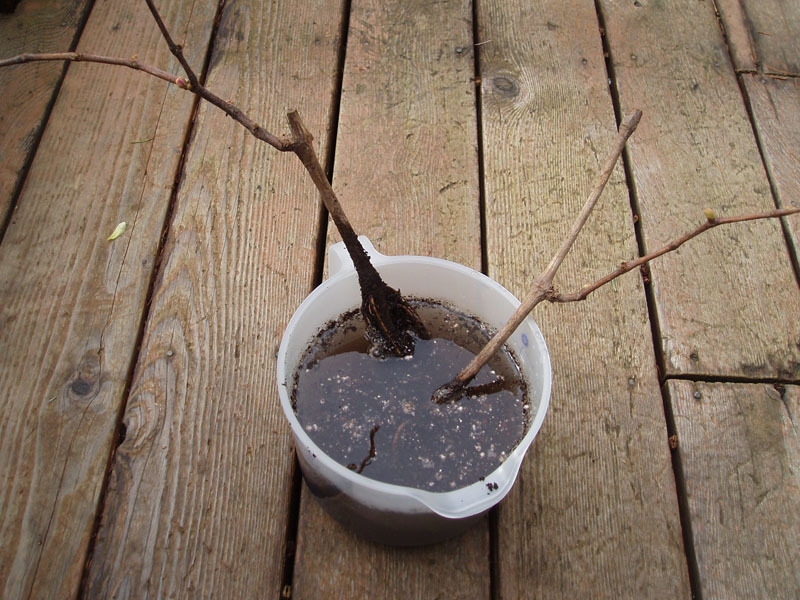 The vines needed to soak in water for a few hours before planting. 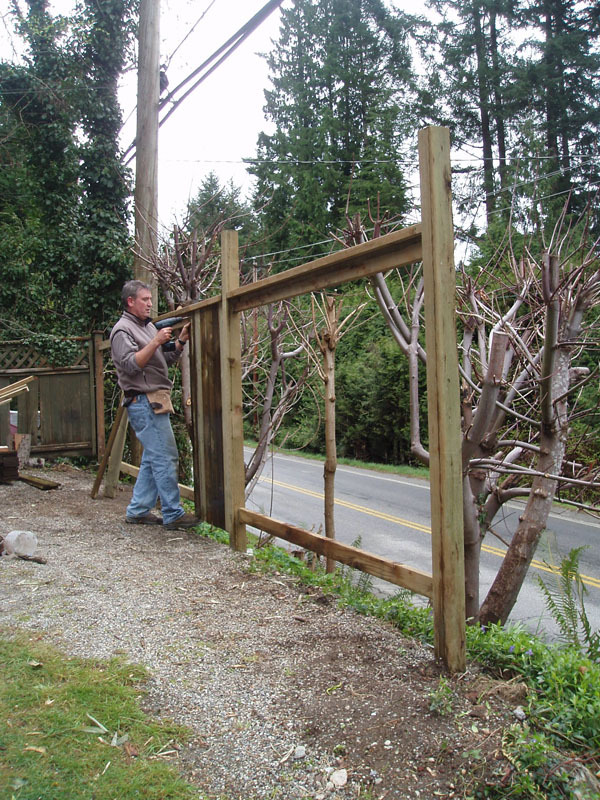 Then Cottager would build the fence and I would plant the grapes. But another squall seemed to blow in every half hour or so. Progress was slow on both fronts. Here's the spot I had picked out. Lots of sun, not much wind. Last year I planned to plant some grapes and didn’t. This year I was determined. This area of the property is on my list for some signficant improvement – in about 2 years time, if I’m lucky. But the sooner you get your grape vines growing, the sooner you might expect to have luscious bowls of purple fruit to share and enjoy. 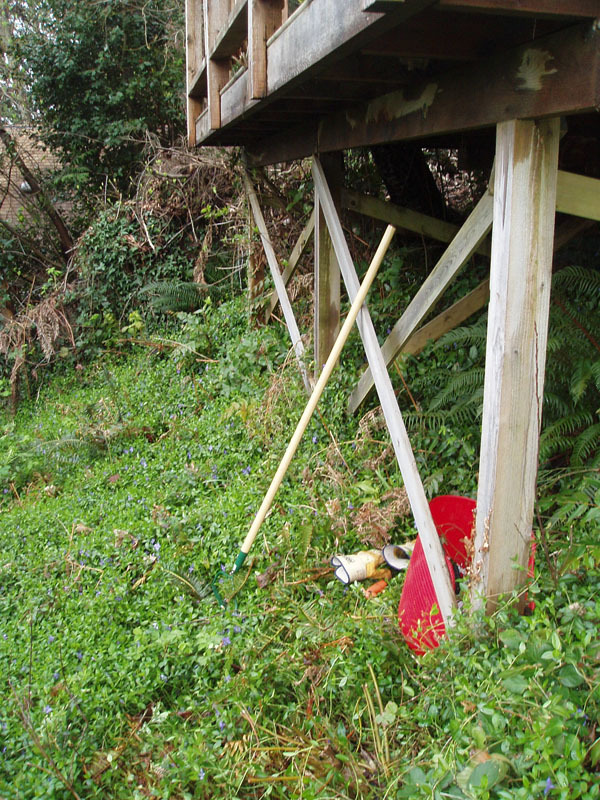 So I hiked up the hill, in the rain, with a bucket of tools, and began to clear some spots for the vines. Hopefully they will like this spot. The bears hope so too, no doubt. Why did my sister and I choose this particular type of grape? Well I don’t see myself making wine in the near future, so table grapes make the most sense. I like that the fruit comes only on new growth, and you cut the vines back hard in the fall. I like tidy. The vines are reputed to be quite hardy, most productive in cool climates, and to produce a vibrant purple fruit that is virtually seedless. I’ll let you know.